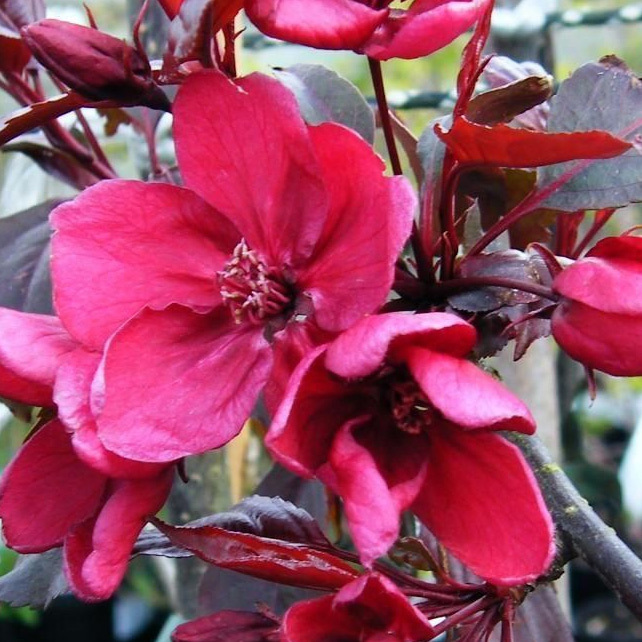 Malus Royalty Crab Apple. Click the link for Cheaper Bare Root Royalty Crab Apple. The Royalty Crab apple has such distinctive characteristics that those folks at the RHS decided to get together in their garden huts and hold a meeting (the sort you need to know the handshake to get in through the door) and give it the RHS Award Of Garden Merit. We don't think the Royalty Crab apple exerted any undue financial influence to gain this award because as you can tell from the photographs it is quite the stunning tree and deserves the award. 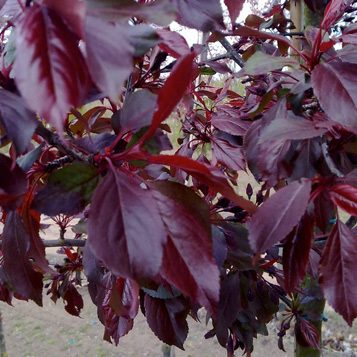 With a weeping shape, very distinctive, purple-red leaves which turn red in late autumn and clusters of large, crimson-purple very fragrant flowers in mid to late spring the tree is unmistakably attention getting. The Royalty is listed in flowering group 4 which means it will flower later in the season compared to other crab apples of a lower number. These numbers are just a guide as UK location and weather conditions can move flowering periods. The Glossy , very small dark-red edible Royalty crab apples which turn purple-black as they ripen can stay on the tree into the winter. This makes it a good choice for early winter colour and great food source for wildlife. Should you not want to cook or juice them, you can pretend that the apples are red tracer bullets as you throw them at unwanted pests in the garden. We of course refer to slugs, snails and the like, not your neighbours cat that is constantly using your greenhouse as a litter tray because that would be cruel despite the fact that it would learn its lesson very quickly and never return. No, that would be a very very bad thing to do and we don't suggest ever doing that. 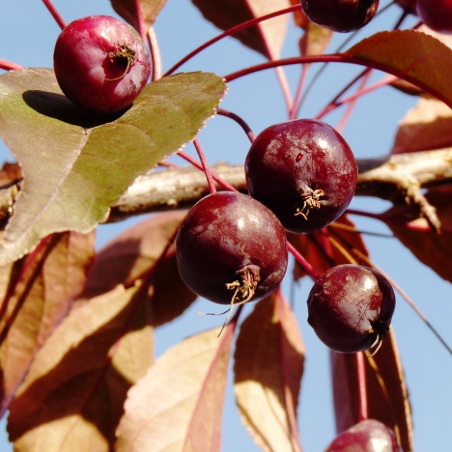 Malus Royalty is listed as a small tree meaning it will grow to around 4m tall at 10 years old with a similar spread. Local soil and weather may mean it stays at that height or goes on to grow more, possibly 3 metres more. Either way, manual pruning will keep it to the height that you want. 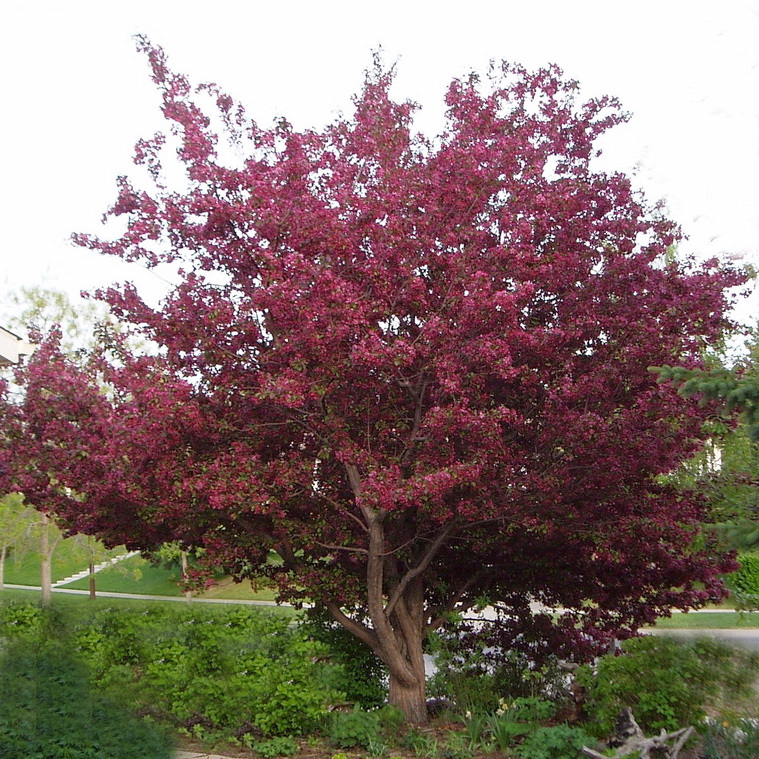 Speaking of pruning, Royalty crab apple does not require any pruning but may benefit from a thinning out from time to time to regenerate new growth. You would want to do this if you were after a particular shape or you felt that more foliage on an area of the tree would make the tree look better. Either way, cutting out diseased, dead or crossing over of branches is general good tree maintenance. 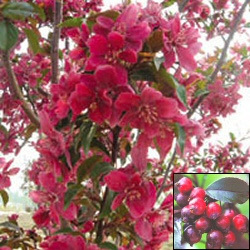 The Royalty crab apple is considered disease resistant which means when compared to other crab apples and not something you can hide behind when Ebola or flesh eating disease runs rampant through your community. It shares some characteristics with gypsies in that you can put it on most types of soil and it will setup home although it is listed as being tolerant to clay. The RHS list it as in hardiness zone 4 which means it will withstand temperatures as low as -34 C.
This tree is supplied at a height of between 1.5m and 2.0m in a 7-12 litre container, which means that the tree can be planted any time of the year.